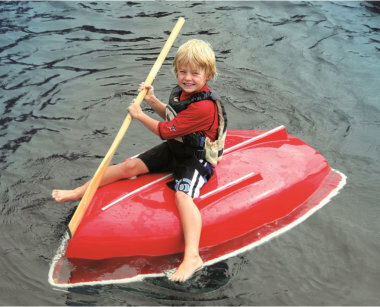 The Starfish Dinghy has been designed for children and is one of the safest boats in its class. Stuart: Naval Architect by profession. A fellow of the Royal Institute of Naval Architects. A member of the Small Craft Design Group and a Chartered Engineer. 27 years teaching Yacht and Boat Design and lecturing in Yacht and Small Craft Design. Has his own design and surveying business. With Stuart Roy’s experience and knowledge, the plans for Starfish were drafted, the brief being the ultimate children’s small rowing boat with optimum safety – We believe that he has designed just such a boat. Stays afloat even when overturned. 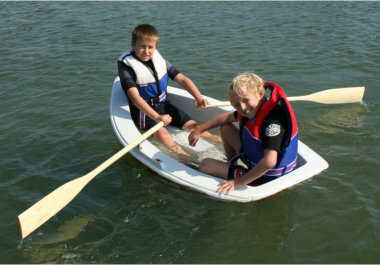 The Starfish Dinghy design has been developed with safety as paramount. The features of the boat were drafted in order that a small child could easily learn the basic skill of rowing. Small craft design legislation has advanced extensively over the last few years under the umbrella of the European Union. The design and build processes being employed have been developed in accordance with these new safety standards. Safe, fun and a fantastic way to introduce kids to the world of boating. Dreams start at that age. Designed for children between the ages of 4 and 12. Superior stability whilst maintaining a shallow draft. Three moulded skegs with sacrificial rubbing strips. Double skinned fibreglass construction with built-in foam buoyancy. Centre and aft seating with moulded footrests for optimal rowing comfort. Non slip floor for confident movement about the boat. A large choice of fun hull colours.